Since 2013 we’ve consulted employers and job candidates amidst a large action agenda of events and consults held on Colorado’s largest campuses and event centers. 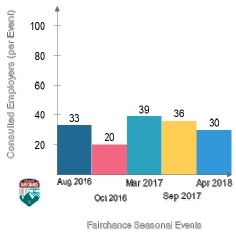 Fairchance was born with its feet on the ground, an outcropping of an existing U.S. Army contract to help U.S. Veterans secure careers. Fairchance was launched as an extension of an Army contract assisting U.S. Veterans. Fairchance is defined by its assistance programs for U.S. Veterans but also Colorado’s Homeless, Justice-involved, and underserved.